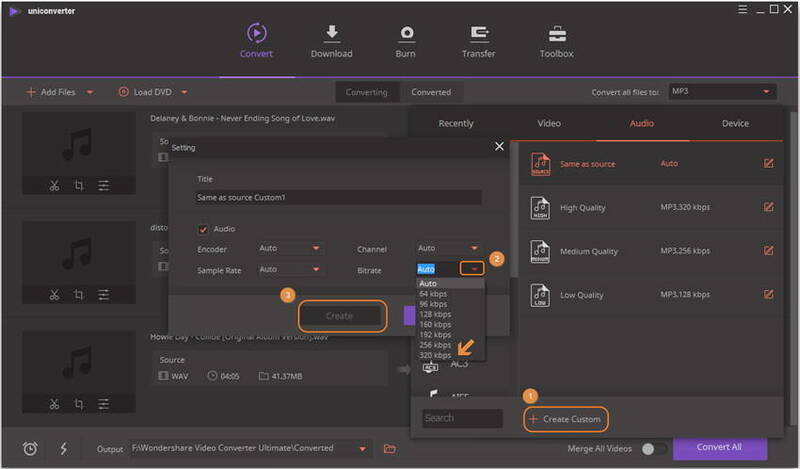 Convert AVI video to WMV, MP4, MOV, MKV and 1000+ video/audio formats. WAV usually stands for high audio quality. Many people still purchase CD and extract them to WAV format. Unfortunately, Google Music doesn't support WAV format. So you have to stay off from Google Music, or find out solutions to play WAV on Google Music. As for audio quality, Google Music support up to 320kbps MP3 music, which, in my opinion, is good enough to listen to. Even the FLAC, one of famous lossless audio format, would be transcoded to 320kbps on Google Music. Now we will show you how to convert WAV to high quality MP3 so that you can upload WAV to Google Music and play virtually anywhere. 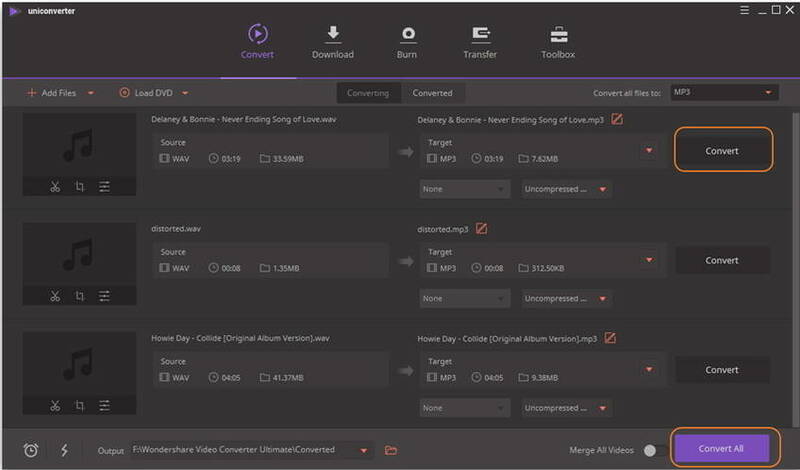 What you need is only a Wondershare WAV to MP3 converter, which could not only convert WAV to MP3, but also supports any common audio files to MP3 conversion. Now see how to convert WAV to MP3 in easy steps before uploading to Google Music. Download and install Video Converter first. Launch Wondershare WAV to MP3 after the installation and add WAV files you want to convert to the primary window. Generally, you have 2 alternative ways to import WAV audio files. Click Add Files in the top-left corner. Direcly drag and drop your desired WAV file from your PC. 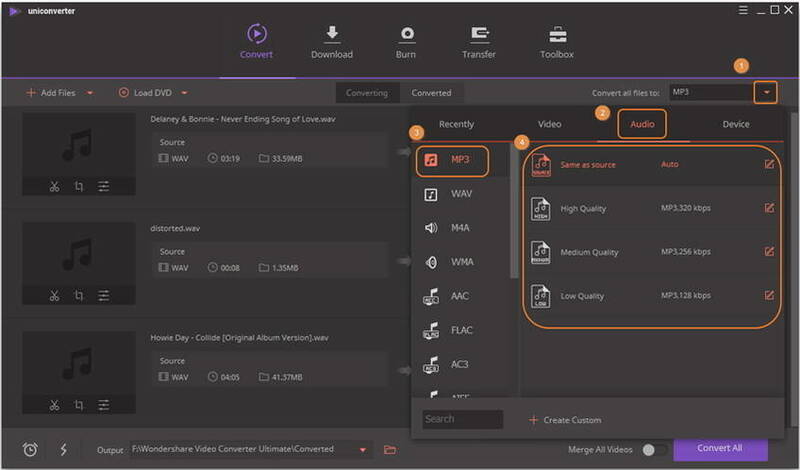 Click in the right side of Convert all files to: and you'll see a drop-down window, go for Audio > MP3 and choose a quality to confirm MP3 as the output format for WAV audio files. After that, hit + Create Custom in to bottom to get the Settings window where you can change the audio bitrate. Click beside Bitrate parameter and change it from the default Auto to 320kbps, which is the highest supported format by Google Music. 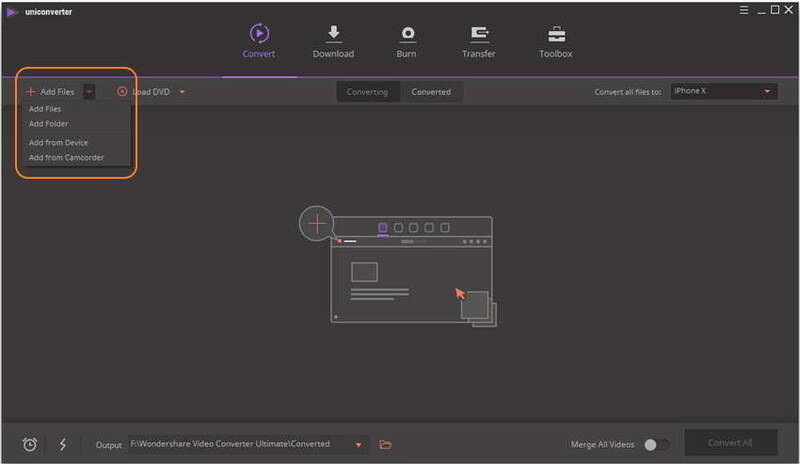 Click the Convert button when everything is ready, and UniConverter (originally Wondershare Video Converter Ultimate) will convert all your WAV files to MP3 format. When WAV to MP3 conversion finished, use the official Google Music Manager to upload high quality MP3 files to Google Music. WAV is the standard audio format used for CD, which usually saved audio data in a 44.1 KHz, 16-bit and stereo format. WAV files are similar to AIFF files. WAV is the most common audio format used in Windows-based computers, while AIFF is more common in Macintosh systems. Both of them are not supported by Google Music.